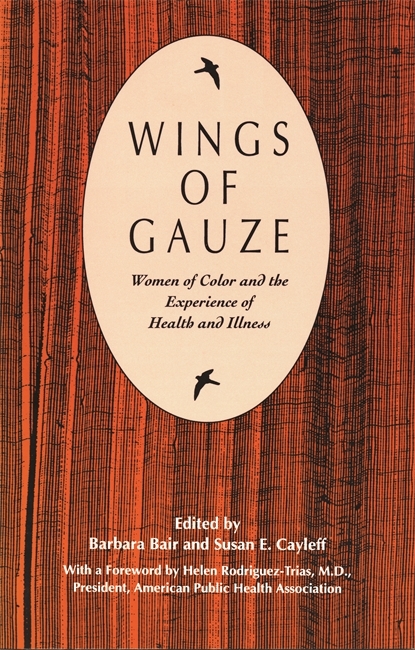 Wings of Gauze is a multidisciplinary anthology of original essays written about the experiences of women of color in the United States - African American, Hispanic American, Native American, and Southeast Asian American. Written by social science and humanities scholars, community activists, and health professionals, the essays illustrate a variety of approaches from a range of academic disciplines, theoretical models, and individual perspectives. Testimony to the many layers of experience by women of color concerning health and illnesses, the essays broaden our understanding of the connections that exist between those experiences and the health issues and cultural standpoints that frame them. With some notable exceptions, recent feminist scholarship about women’s health and the history of health care has focused primarily on the experiences of white middle-class women. Literature by health professional about people of color has focused upon illness and perceived deviance from white-defined norms rather than upon the political economy of health and alternative concepts of well-being. It also has focused on men rather than women, and on African Americans to the exclusion of other peoples of color. This collection – the first of its kind – is a shift away from this standard paradigm and instead makes women of color and their perceptions the central reality. The book includes creative writing, participant-observer perspectives, personal narratives, survey studies, and studies based on oral history. Specific health issues, including AIDS, domestic violence, substance abuse, cancer, reproductive health, surgery, sickle cell disease, infectious disease, mental health, and the economic dimensions of physical and psychological health, are addressed. While the focus of the book is on experiences of health and illness and on health policy, there are also essays on the experiences of women of color as health practitioners – ethno-therapists, healers, midwives, health aides, and community social workers. Barbara Bair, Ph.D., is a Fellow of the Virginia Center for the Humanities, Charlottesville, and was for many years an Associate of the James B. Coleman African Studies Center at the University of California, Los Angeles. She has taught interdisciplinary courses in American literature, women and health, and American cultural and social history. Susan E. Cayleff, Ph.D., is a Professor in the Department of Women’s Studies at San Diego State University. She teaches women’s history from a multi-cultural perspective, women and health, women’s sexualiyy, and women and sports. Finally, a book in which the lifeworld of women of color emerges to challenge the narrow medical discourse on health. This is a finely nuanced collection that should be read by anyone who wants to understand the meansing so health and illness in American communities.